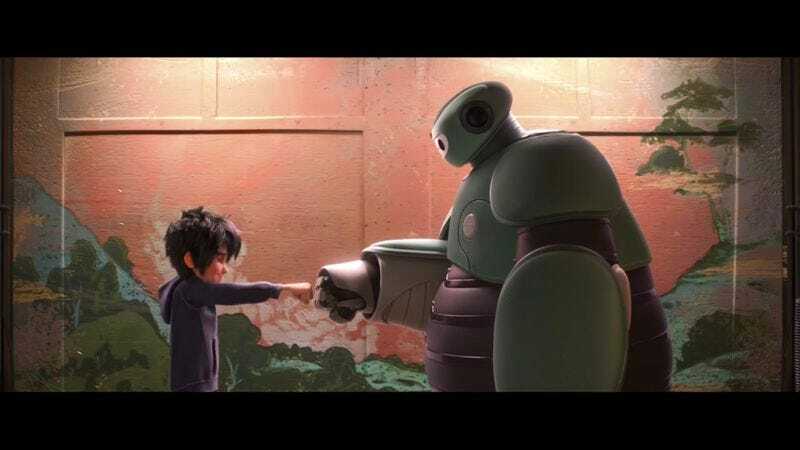 One of the most charming and incredibly quotable parts of Big Hero 6 is when protagonist Hiro tries to teach his robot friend Baymax how to properly do a fist bump. Baymax gets the moves down right, but the sound he makes is a bit…different. Entertainment Weekly has an oral history of how many people were involved in order to arrive at the proper sound for Baymax to use, working with the film’s writers, directors, and voice of Baymax, Scott Adsit (30 Rock, Moral Orel). While it can be excruciating to dissect what makes something “funny” or “work” in a film, the piece does a great job of showing how small details can end up resonating in a huge way with audiences. From the conception of a shorthand for Hiro’s relationship with his brother to Adsit’s improvisation with direction of “Baymax does a robot sound equivalent of an explosion,” the moment went through many iterations before Disney realized what they had. Then, under direction of John Lasseter and others who gave notes on the story, the filmmakers were able to weave the sound throughout the film and end up elevating it from a silly, weird moment into a poignant reminder of loss and friendship. It’s an entertaining read and a great insight into the way that story and emotions are conceived and refined throughout the modern Disney filmmaking process.